« Red Moon? Might the Great Tribulation Begin in 2013? German Chancellor Angela Merkel is awarded this year’s Charlemagne Prize in acknowledgment for her contribution to European integration. The annual ceremony which is held in the German city of Aachen, close to the Belgian and French border is where the French President Nicolas Sarkozy praised Merkel’s qualities. Sarkozy was referring to Merkel’s origins of being a Protestant from the former Communist East Germany, EuroNews reported. 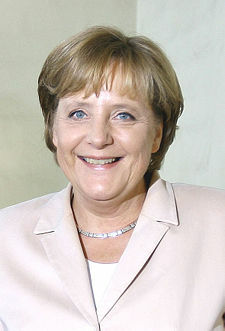 Merkel won the prize specifically for negotiating an agreement on the EU’s Lisbon reform treaty. The Charlemagne Prize is named after the Holy Roman Emperor Charlemagne. He was the King of the Franks from 742-814 A.D and gained control of most of Western Europe in 800 A.D by uniting its Christian countries. The Pope gave him the title of “Holy Roman Emperor”. Charlemagne had a great influence on the European civilization, by establishing a new legal system as well as encouraging art, literature, and education. Did you know that the European leadership is intent on establishing a new “Holy Roman Empire”? Did you know that Catholic prophecies look forward to this, as well as the destruction of the English, the Protestants, and the Muslims? Saint Cataldus of Tarentino (c. 500): “The Great Monarch will be in war till he is forty years of age….he will assemble great armies and expel tyrants from his empire. He will conquer England and other island empires” (Connor, Edward. Prophecy for Today. Imprimatur + A.J. Willinger, Bishop of Monterey-Fresno; Reprint: Tan Books and Publishers, Rockford (IL), 1984, p.30). St. Methodius (385). “A day will come when the enemies of Christ will boast…Then a Roman emperor will rise in great fury against them…In the last period Christians will not appreciate the great grace of God who provided a Great Monarch, a long duration of peace, a splendid fertility of the earth…Many men will wonder if the Catholic faith is the true and only saving one and whether the Jews are perhaps correct when they still expect the Messias (Culleton, R. Gerald. The Prophets and Our Times. Nihil Obstat: L. Arvin. Imprimatur: Philip G. Scher, Bishop of Monterey-Fresno, November 15, 1941. Reprint 1974, TAN Books, Rockford (IL), p. 110). Monk Adso (d. 992). “Some of our Teachers say that a King of the Franks will possess the entire Roman Empire. This King will be the greatest and the last of all Monarchs, and after having prosperously governed his kingdom, he will come in the end to Jerusalem and he will lay down his sceptre and his crown upon the Mount of Olives and immediately afterwards, Anti-Christ will come” (Cullerton, p.137). Notice that the end is predicted to come shortly after this Emperor comes–we in the Living Church of God feel that this Great Monarch/Emperor is the Beast of Revelation and the final King of the North that the prophet Daniel warned about. The pieces are coming together to unite Europe to fulfill biblical, as well as many Catholic, prophecies. And the end will come shortly thereafter. This entry was posted on Friday, May 2nd, 2008 at 6:46 am	and is filed under Prophecy. EU’s Van Rompuy & Pope Meet in Vatican City: Preparing for a ‘Holy Roman Empire’?